The Neo-Grec brownstone, one of nine on the Upper East Side block, was built in 1882 on land acquired from Charles Tiffany, father of Louis Comfort Tiffany. In addition to careful restoration of the brownstone façade, a stained glass-enclosed rooftop conservatory was added at the rear of the building. The front parlor, whose walls are upholstered in a custom silk lampas reproduced by Scalamandre from original fragments found in the house, serves as a mini-art gallery that includes Julius LeBlanc Stewart’s An Interesting Letter and Lady on a Pink Divan. 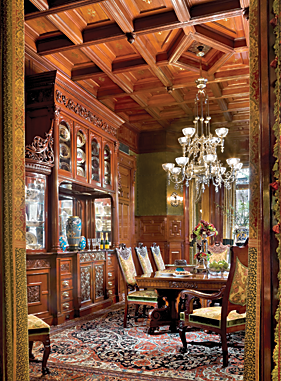 The foyer is entered via antique double doors that feature textured-glass panels and cabochon jewels. Colors of the original encaustic tile floor, made by Boch Freres, inspired the palette for the stairwell. Inspired by Bruce Talbert, David Scott Parker designed the sunflower wallpaper that continues up the stairwells, linking the floors. The rosewood mirror and gryphon newel lamp are attributed to Herter Brothers. A rosewood pouf with marquetry and brass inlay, attributed to Herts Brothers, is a focal point of the parlor. It is topped with an American Aesthetic Movement silver- and brass-plated gas newel lamp with candelabra. Edouard Manet’s Woman Leaning on a Garden Vase hangs next to the mantel. Framed by the flickering flames of gaslight sconces, textured cast-glass door panels sparkle in the twilight, their magical glow hinting at the resplendent interior within. Possessing a marvel and passion for a time that New York has long since forgotten, Michael and Margie Loeb have spent the last decade taking their six-and-a-half-story brownstone on Manhattan’s Upper East Side back to its nineteenth-century roots while making it into their own twenty-first-century home. 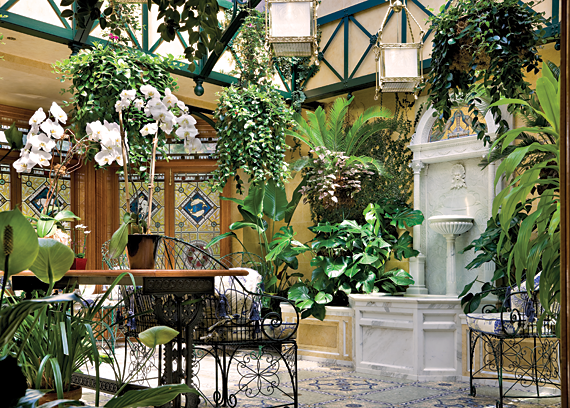 The Loebs, who share the 1882 Neo-Grec townhouse with their fourteen-year-old triplets, restored the residence and furnished it with nineteenth-century artwork as well as Aesthetic Movement furnishings, fixtures, and decorative accessories. 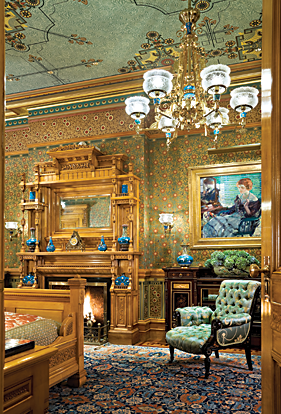 The parlor’s ceiling is decorated with custom paper designed by Parker that was inspired by that in the Governor Oliver Ames mansion in Boston designed by Herter Brothers circa 1880. The gold tesserae field pattern has a Chinese lattice border printed on a gold-leaf ground. The ornate polychrome plaster cornice was reproduced from original fragments. The parlor’s curtains are a custom Scalamandre silk lampas, Berry & Vine, reproduced from original fabric discovered on the pouf under newer layers of upholstery. 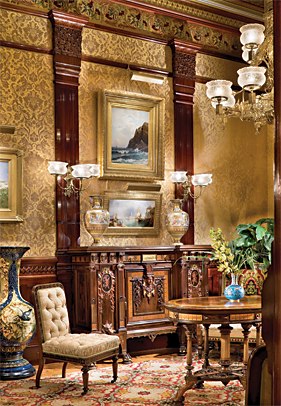 The parlor features a new pair of twelve-arm custom gasoliers designed and manufactured for the project by Quality Lighting. 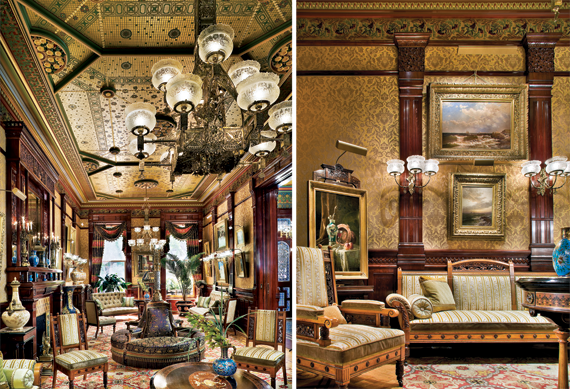 The two parlor suites are attributed to Herter Brothers. In Gloucester Harbor (top) and Sunrise on the Coast. The magnificent Renaissance Revival rosewood cabinet at the end of the parlor was created by Herter Brothers in the early 1870s. Thomas Moran’s Canal in Venice, 1905, hangs between a monumental pair of Minton vases designed by John Moyr Smith for the 1878 Paris Exhibition, and above, Alfred Thompson Bricher’s Ships off a Rocky Coast. They enlisted architects David Scott Parker and John Wasilewski, historic interiors consultant Mimi Findlay and Traditional Line builder Anthony Lefeber to research, restore, and seamlessly update the period residence. The house had incurred miscellaneous modifications through its many decades, and the Loebs decided to retain some of the more sympathetic alterations. They opted to keep the first-floor dining room, which was created in 1889 by converting the rear half of the double parlor. The elevator was allowed to stay, but it was enlarged without making significant changes to the home’s floor plan. But they removed the modern industrial metal “ribbon” window that had been installed across the third-floor façade after a 1936 fire. 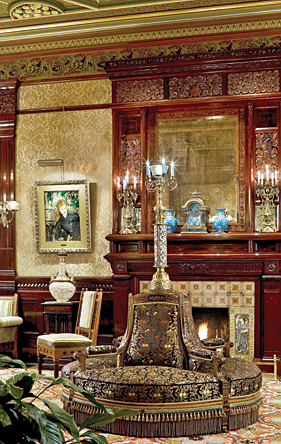 And they opted to undo the 1925 European-style redecoration of the parlor and music room. 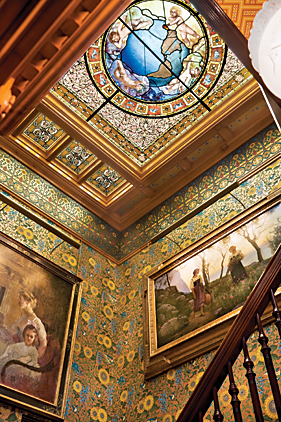 A conservatory, containing a Tiffany Studios white marble and mosaic fountain and a rare set of English antique stained-glass windows that contains signs of the zodiac, was added to the top of the house. 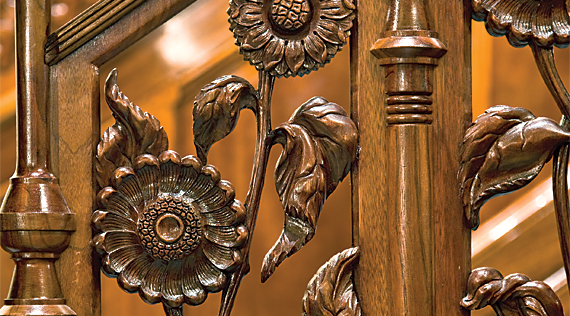 Sunflowers, a common motif of Aesthetic Movement style, adorn the banister of the stair hall. Margie points out that this was quite a feat because the lights had to be installed before the paper was even designed. One of the greater challenges was undertaken by Findlay: It fell to her to locate more than two hundred appropriate period lighting fixtures. In the master suite, for instance, only one of the six matching enfilade chandeliers is an antique; the others are carefully crafted replicas. Acquiring enough antique etched-glass shades for the chandeliers was yet another task. 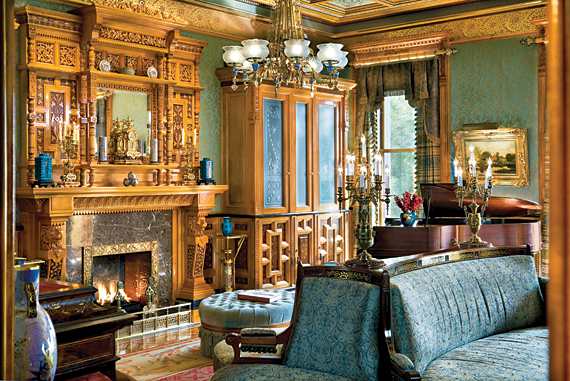 The music room leads to the master suite dressing rooms, which retain their original carved maple woodwork. A six-piece set of four-arm cast brass and Longwy tile chandeliers lead to the master bedroom. One is an antique; the others were fabricated under the direction of Mimi Findlay and include new tile elements reproduced by the original factory in Longwy, France. A corner of the master bedroom, glimpsed through a portiere, features a Herter Brothers’ rosewood recamier and Charles Courtney Curran’s Green Lattice, 1919. Although the mantel remained, the overmantel in the master bedroom had been removed in the twentieth century. Shadows on the plaster provided clues for its recreation. Its shelves display a few of the Loebs’ Christopher Dresser-designed Minton vases. Richard Edward Miller’s Seated Lady with Red Hair hangs to the right. 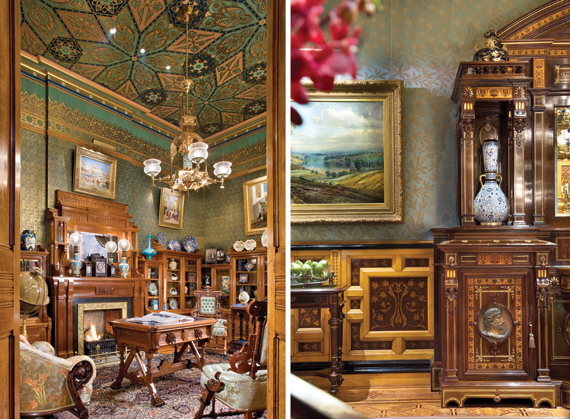 They concentrated on museum-quality pieces, notably magnificent furnishings by Herter Brothers, ceramics by Christopher Dresser, and stained glass windows by Louis Comfort Tiffany. They bought paintings by Hudson River School artists Thomas Moran, Alfred Thompson Bricher, and Albert Bierstadt; genre scenes by Julius LeBlanc Stewart; orientalist works by Edwin Lord Weeks; landscapes by William Merritt Chase; and portraits of women by Charles Webster Hawthorne and Edouard Manet. They arranged and hung them by subject category, effectively creating mini-galleries in every room. In essence, the house has become a work of art, their period piece so to speak. 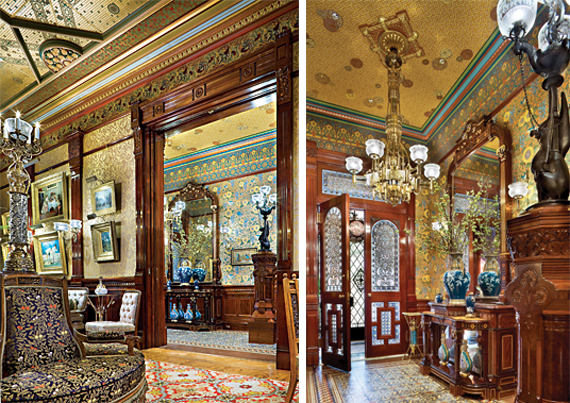 The wallcoverings were either reproduced from the originals or custom designed by Parker and his associates and were made to look as they would have when they were created—not bleached, faded, or worn by time. Rather than incorporate bronzing powders, several wallpapers were printed on gold leaf so they won’t inevitably lose their luster. Woodwork throughout the house was restored and French polished. Missing pieces were carved to match and complement the originals; there was enough work to keep two carvers busy for five years. Originally a nursery, this space is now Margie Loeb’s dressing room. 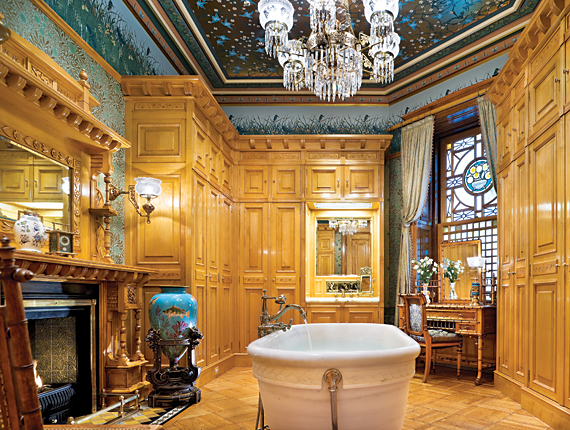 A rare antique glass-tile window made by Louis Comfort Tiffany illuminates the room, which is appointed with a custom white marble tub by Elizabeth Street. The fourth-floor family room began its life as servant quarters. It’s appointed in the Modern Gothic taste. The Knole sofa and settee were custom designed based upon plates in Charles Locke Eastlake’s Hints of Household Taste. The large oak sideboard is attributed to Herter Brothers and features exquisite foliate relief and figural carvings. In a nod to the children in the house, the antique linen curtains illustrate the tale of Aladdin’s lamp with scenes attributed to Lewis Day. 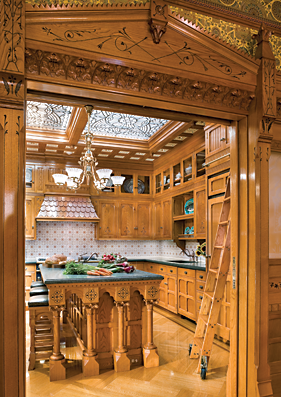 Adjacent to the family room, the kitchen continues the Modern Gothic theme, this time with chestnut cabinetry designed by the Parker firm. The space is flooded with natural light from an antique four-panel textured-glass skylight. “It’s the attention to detail that takes the house to another level,” Parker says, adding that on innumerable days more than a hundred artisans and skilled craftsmen could be found working throughout the house. The couple’s quest to reestablish the past glory of the brownstone was all the more urgent because of the nine adjacent originally built, only two remain. The other one, to which the Loeb house is attached like a Siamese twin, has been stripped of its exterior ornament and charm and painted white. Only the ghost lines of its former fabulous façade are visible. Despite the period preciseness, the Loebs have gone out of their way to create a comfortable, contemporary living space that starts with the arrangement of the rooms. While the first floor is reserved for formal entertaining and occasional charity events, the upper floors have a more relaxed, family feel. The master suite, which includes a music room that has an 1882 Steinway & Sons piano, dominates the second floor and features a kitchenette and office space for Margie. 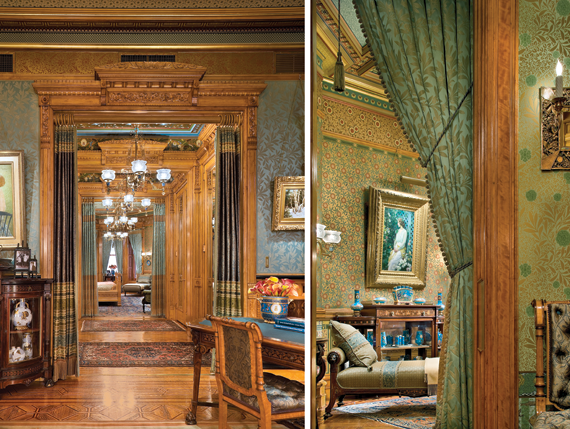 The room’s wainscoting, attributed to Herter Brothers, was once in a New York City townhouse owned by the Roosevelt family. The large back-to-back sofa, designed by Parker, separates into pieces to make the room more versatile. A flat-screen television is hidden behind an enormous mirror above a Herter Brothers console. The adjacent dressing room features dramatic original floor-to-floor mirrored cabinetry that conceals closets—an anomaly in nineteenth-century homes. The top-floor conservatory was added by the Loebs. It features a white marble and peacock eglomise mosaic fountain attributed to Tiffany Studios and a rare set of English Aesthetic Movement stained-glass windows depicting the signs of the zodiac to complement the theme of the adjoining stair-hall lay light. A period stained-glass lay light sporting signs of the zodiac tops the stair hall, replacing a modern roof fire stair. The change opened up the space for artwork, which includes Charles Caryl Coleman’s Twilight and Poppies, 1889. The children’s rooms are on the floor above with ample space where they gather to do their homework. Originally staff quarters, the top floor, which includes the kitchen, is now the heart of the house. At some point in time, it had been turned into a generic modern white-on-white apartment. Because there was no existing woodwork, it afforded the opportunity to create a different look, and they chose the Modern Gothic style. The Loebs don’t see their collection as mere art objects; each piece has meaning, not to mention rare beauty. Each room has its own personality, so it’s hard for them to play favorites. 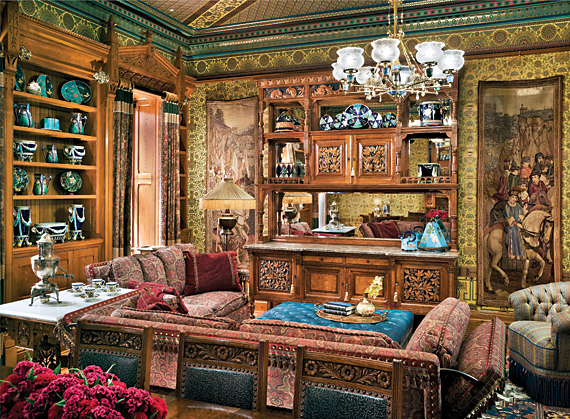 Margie, however, is partial to the Moorish-style library, a cozy corner that’s off the dining room. It is appointed with a Hunzinger parlor set that they brought over from their previous house and features a Tiffany Studios wisteria window and a series of paintings done by Edwin Lord Weeks during a trip to India. The Loebs regard their brownstone as a work in progress and don’t mind the notion that it may never be finished. As she walks up the stairs to her office, Margie comments that there is still more space for paintings on the walls of the upper landings.